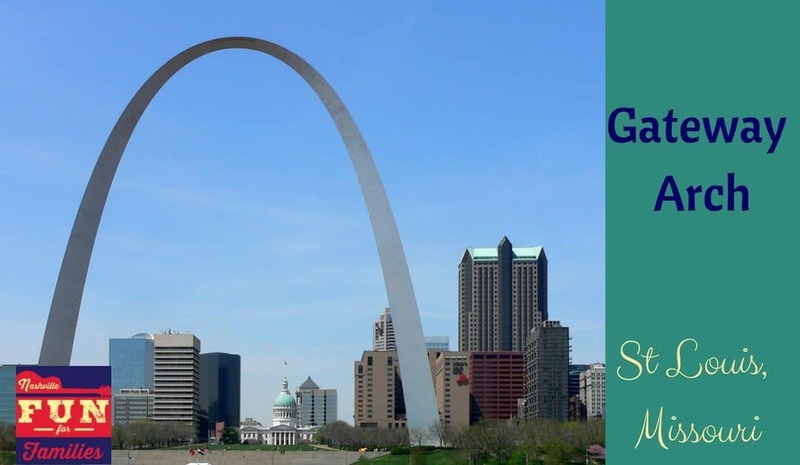 The Gateway Arch in St Louis, Missouri is one of America’s great landmarks. If your family has a ‘bucket list’, then a trip to the top of the Arch should definitely be on it! The Arch was built between 1963 and 1965. It was opened to the public in 1967. At 630 feet, the Gateway Arch is the largest man made monument in the United States. The area surrounding the Arch is a beautiful riverfront park. It is right in the heart of downtown St Louis so traffic is going to be a challenge depending on the timing of your visit. There is a large parking garage off Washington Avenue. We had no trouble finding a spot. (If you need information on getting to the arch via public transportation, you can find that here.) From the garage, it is a short walk to the Arch. The area is paved so it would be stroller or wheelchair accessible. ALERT: The Gateway Arch Ticketing & Visitor Center has relocated to the Old Courthouse at 11 N. 4th Street. The walking distance between the Old Courthouse and the Arch entrance at the SOUTH leg is approximately 0.3 miles (7 minutes of average walking time). EACH guest planning to enter the Gateway Arch will be required to have EITHER a Journey to the Top ticket or an Arch Entry-Only ticket to be allowed access to the facility. Tram tickets will sell out early and often – advance tickets are strongly recommended. Please Note: The Museum of Westward Expansion, located under the Gateway Arch is closed for significant renovations. Certain artifacts from the Museum are on display in exhibit galleries at the Old Courthouse. Be prepared for the process once you reach the Visitor Center. 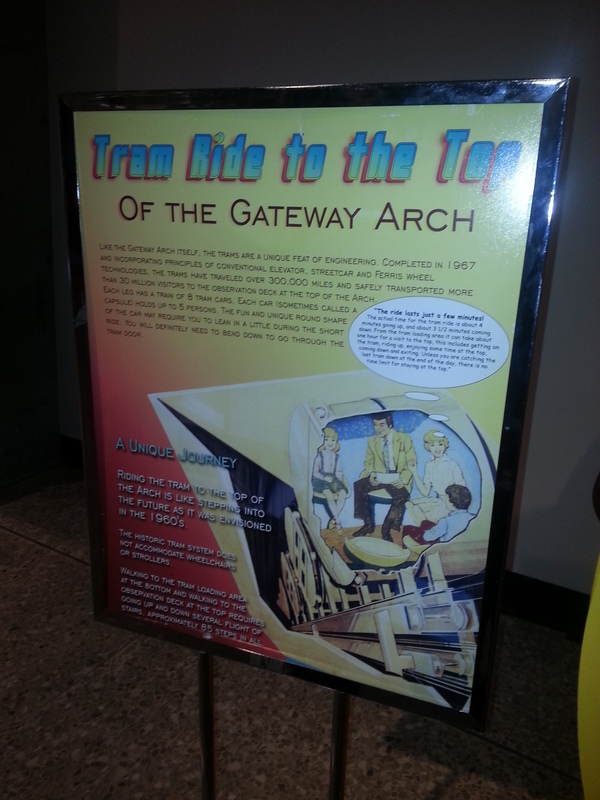 The Gateway Arch is designated as a US. National Historic Landmark. Due to that, you must pass through security to enter the building. The line moves pretty quickly but be aware that most of the line is outside the building. So you may be exposed to whatever the weather is for an extended period of time. There are lots of security personnel here. If your kids aren’t used to that, you may want to explain their presence beforehand. Also, think about what you carry in your purse and pockets. One gentleman that was in line behind us carried a regular pocket knife with him. He had to leave his family and go all the way back to his car to store it. Once you have made it inside the building, you will be in a huge area with lots to see. On your left will be the gift shop, restrooms and vending machines. The restrooms are large, clean and equipped with changing tables. On the other side of the restrooms is the ticket area. Tickets can be purchased here for the Journey to the Top and Monument to the Dream Movie. When we visited the first time, we arrived around 4PM. The Arch closed for the day (during that season) at 6PM. We thought that would be plenty of time. Unfortunately, all the remaining tours for that day were sold out. We returned the next morning just a few minutes after the official opening time. We made it quickly through security and bought tickets for the Journey to the Top with no problems. By the time we finished our tour (around 2 hours later) the lines for tickets and getting into the building were VERY long. So learn from our mistakes. Plan to be there when it opens and save yourself lots of frustration. 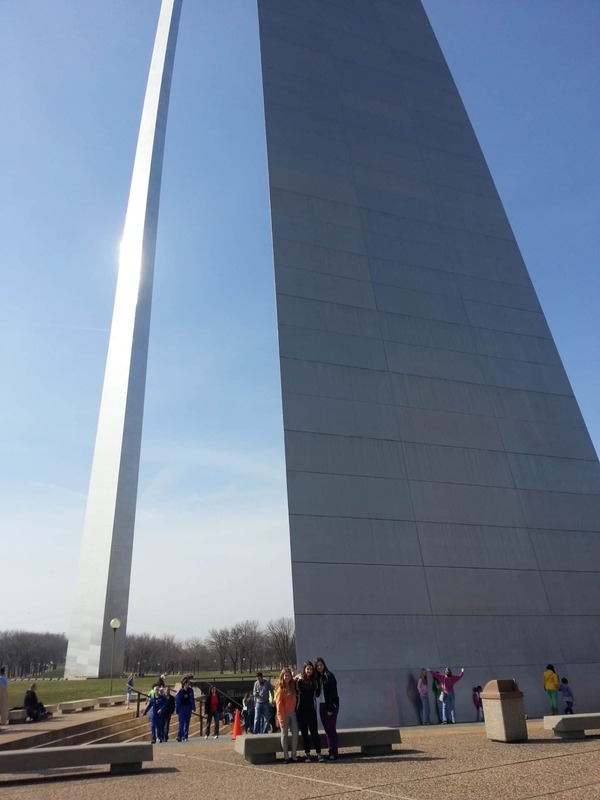 Tours to the top of the Arch are scheduled a few times per hour and they depart on either side of the building. When you purchase your tickets, the attendant will tell you the time and side where you need to board your tour. We had around 20 minutes between the time we bought our tickets until the tour started. We spent that time exploring the Museum of Westward Expansion, This museum is located directly across from the ticket counter. Admission is free. It is a really interesting museum mostly filled with large displays. There are also some life size mannequins who tell stories. This may thrill your kids…or freak them out. If you don’t get a chance to see all the displays during the wait for your tour, you can come back afterwards and spend as long as you like. Once it is time for your designated tour, you will be issued a boarding pass. The Arch employees do their best to keep groups together. The ‘capsules’ hold 5 people. You will stand in line for a bit while every group gets a photo taken (available for purchase after your tour!) The waiting area is really unique. There are life size cut outs depicting Missouri history. The wait is less than 10 minutes at this point. From here you will go through a series of corridors to the loading area. You and your party will stand on a step with the corresponding number to your boarding pass. Passengers coming down will disembark first and then you are able to load up. The car that you ride in is called a ‘capsule’. It’s round and has low seats. It looks ridiculously small but don’t let that scare you. It’s quite roomy inside. If you have severe claustrophobia issues, you probably won’t enjoy it. Once everyone is loaded, the doors shut and the ride to the top begins. The ascent is quite slow and not scary at all. This is not like the climbing part of a roller coaster. I am no big fan of heights or thrill rides and this didn’t bother me in the least. Once you reach the top, you will exit the capsule and walk up to the observation deck. Once at the top, you are not limited by a time schedule. You can stay and take pictures or just gaze out the multitude of windows for as long as you want. There are trips back down leaving on a regular basis so you just get in line and grab the first available capsule. The trip down is just as slow and non-scary as the trip to the top. Once you make it to the bottom, you can continue your explorations of the museum or gift shops. 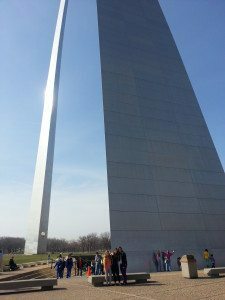 Make sure to spend some time outside exploring the Gateway Arch from the ground level.